The American opera scene has grown with the country, spawning aproliferation of beautiful and enchanting opera houses. This uniqueguided tour covers almost 100 historical and contemporary operahouses dating from 1765 up to the present--halls such as theAcademy of Music in Philadelphia, the San Francisco Opera House,and the Cullen Theater in Houston. America's opera houses present an eclectic collection of buildings,from converted warehouses to ornate vaudevillian venues and modernconcrete and glass structures. 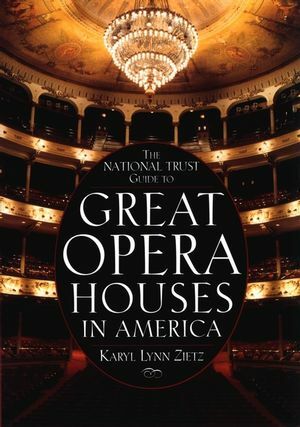 The National Trust Guide to GreatOpera Houses in America celebrates this dynamic range ofarchitectural types and styles, revealing how European elementswere transformed into a distinctly authentic and vital part ofAmerica's architectural and musical heritage. Grouped by geographic region, this easy-to-use resource containsimportant historical information on structures--some destroyed aswell as those still standing--including dates, name changes,seating capacity, and more. Many of the buildings featured areNational Historic Landmarks or are listed in the National Registerof Historic Places. Almost 140 vintage and recent photographs bringto life these magnificent buildings and the operatic scenes enactedon their stages. Whether used as a travel planner or an armchair reference, thisdefinitive book is a must for music and theater enthusiasts,architects, designers, and preservationists--the perfect front rowseat to the dramatic history of opera in America. KARYL LYNN ZIETZ, a noted opera expert, is the Americancorrespondent for the publication about Teatro Alla Scala in Milan,and writes for Opera Now in London, Orpheus in Berlin, and OperaAustralasia in Sydney. She is the author of Opera! The Guide toWestern Europe's Great Houses and Opera Companies of the UnitedStates. THE NATIONAL TRUST FOR HISTORIC PRESERVATION is the only private,nonprofit organization chartered by Congress to encourage publicparticipation in the preservation of sites, buildings, and objectssignificant in American history and culture. Early Opera Houses in America, 1765-1865. Historic Opera Houses in the East. Historic Opera Houses in the South. Historic Opera Houses in the Midwest. Historic Opera Houses in the West. Opera Houses of the 1960s and 1970s. Opera Houses of the 1980s and 1990s.